Real Events In Real Places At Some Of The Most Interesting Locations In The Old West! Want to become an author? 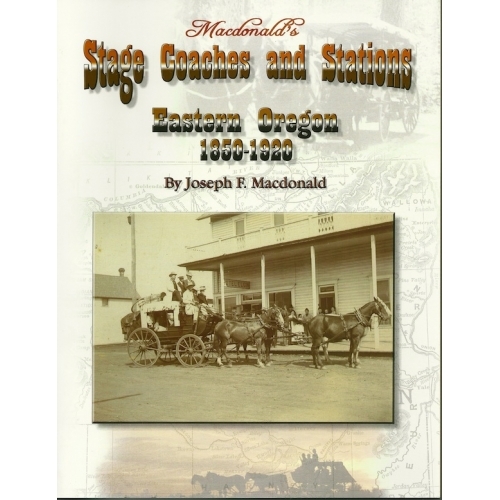 This book is Volume 1 of a pioneering effort, detailing information on the stage companies that supplied the transportation network for the widely-dispersed communities of Eastern Oregon. In addition to the hub locations, large towns such as Baker City, Burns, Prineville and The Dalles, the book lists and locates all of the small communities that benefitted from stage service, as well as the way stations that provided feed, water and a change of horses for the stage company. One of the fun things you can do with this book is to plan an itinerary to get from one place to another by stage, which could take days for a trip that we now cover in hours. Four regional maps depict the major routes. Other sections cover the Express companies that operated in the early years, and the mail contracts and Star Routes that were essential for profitable operation. A Glossary discusses common staging terms. The information provided includes stories of stage accidents and stage robberies, though there were fewer of the latter than one might expect. There is an extensive index listing both people and places. Until now, there has been no single source for the information provided in this book, which has been gathered from official records, newspaper accounts, and a wide variety of individual sources. There are likely to be minor omissions, and the identity of many drivers and hostlers may never be known; but the information presented can be documented from one of the sources listed in the book. Joe Macdonald has long been involved in researching the history of the Pacific Northwest and has previously published on Pacific Northwest steamboats. This stage coach book has numerous illustrations of staging and stage company advertisements collected over several decades. Paperback, 172 pages, 8.5 by 11 inches.